Tracie Rivera, RN, BSN stands by the flowers that she received from one of her patients, thanking her for taking such good care of him. “A simple thank you is the greatest reward for me,” Tracie said. Somewhere between the major hospitals and the surgery centers scattered throughout Oklahoma City, OK, you will find Northwest Surgical Hospital, located at 9204 N. May. Tracie Rivera, RN, BSN is a medical surgery nurse. “I enjoy taking care of the patient,” she said. Tracie grew up in Enid, Oklahoma. Tracie’s first job was a teacher, receiving her degree in Health Science Technology. She taught at several different schools teaching classes from Pre-K up to high school and plenty of grades in-between. Isn’t it funny how certain things happen to us when we least expect it? 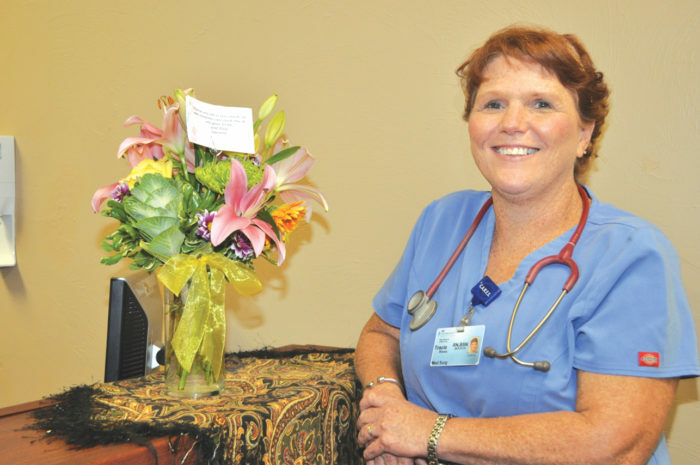 After teaching for 20 years, her 21 year old daughter started nursing school at UCO. It was at this time that Tracie wanted to go to nursing school too. What an unusual turn of events. Fast forward, Tracie and her daughter graduated nursing school together. Tracie’s family and friends were very supportive of her going back to school. Mother and daughter both graduated on the same night. What a unique celebration for the family! Now, Tracie has been a nurse for 6 years, working at Community South up until about a year ago, then came to Northwest Surgical Hospital. Her daughter is also a nurse, working at Baptist Hospital. 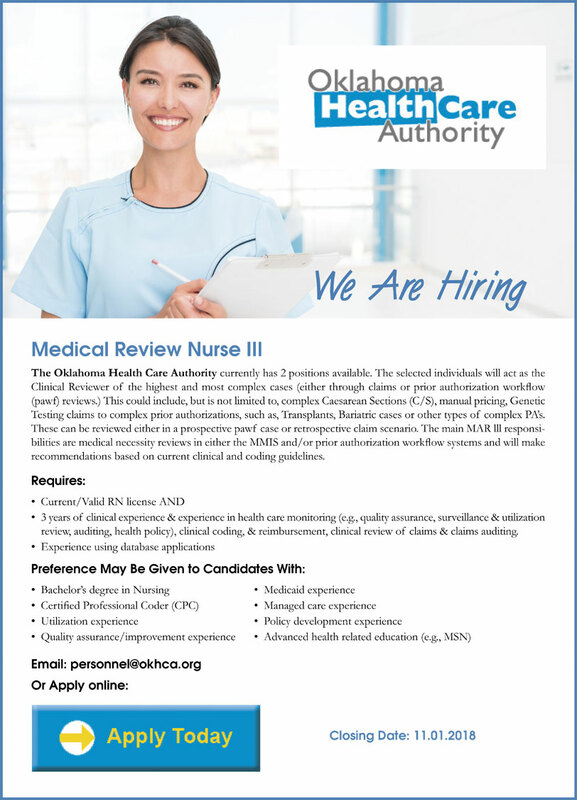 What qualities make a good nurse? I ask Tracie. “I think a nurse needs to be caring and considerate, thinking of the patient’s feelings first,” Tracie replied. Tracie’s favorite part of her job is taking care of the patients. “I love caring for the patients and I love how I get to interact with them,” she said. If Tracie were going to give advice to someone going into the medical field, she would tell them that when you are a nurse, you will never be lost for a job opportunity. “Being a nurse means you have plenty of places to work, no matter what area you decided to go to. If one medical field is not your forte, move on to another one,” Tracie answered. Describing her personality, Tracie considers herself a people person, caring, putting the patient’s feelings first, organized and very talkative. She considers herself a leader when it comes to being a nurse, yet, a follower when she wants advice from a doctor or another nurse. She is not afraid to ask questions. Tracie and her husband have been married for 32 years and have 4 grown children. Their pets include two Dobermans and one cat. With work and family, Tracie still has time to enjoy several hobbies. She does quilting, likes to re-do furniture, enjoys gardening and loves canning jellies. “We have a lot of trees on our property and I like to make use of all of the fruit,” Tracie says. “I make apple, cherry, strawberry, plum and mixed fruit. My grandmother canned jellies, my mom canned jellies and now, I do it,” she added. Tracie has several words of wisdom that she likes to live by. This too shall pass, there’s nothing that can keep you down, and situations always change. “I tell these to the patients, my kids and sometimes, myself,” she said with a laugh. On the humorous side, I asked Tracie if she had ever done anything unusual since she has been a nurse. “When I was just starting out as a new nurse, I was very nervous. One of the main nurses asked me to give her a shot. I told her that I hadn’t given a lot of shots before, returning the comment that’s okay. So, I got the shot ready, walked into the exam room where the nurse was leaned over the table with her cheeks showing. I gave her the shot alright! Apparently, I did it pretty hard because she stood straight up and yelled with a loud OUCH! (Kind of like the first day jitters and it was like a dart jab). The next day, I asked the nurse how she was doing. Pulling her pants halfway down, her cheek was black and blue and swollen. As I gasped with surprise, she told me that I needed more practice,” she said with a laugh. will make recommendations based on current clinical and coding guidelines.